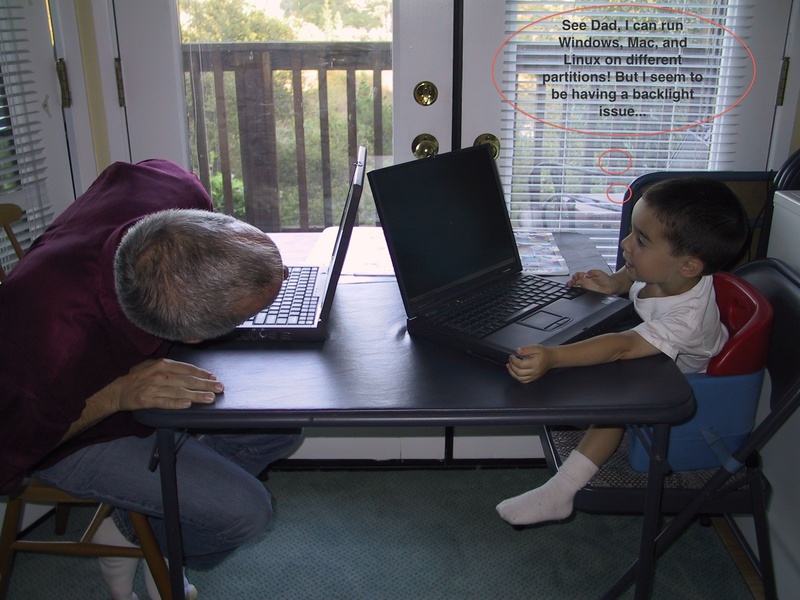 Tech Savvy from the start! Disclaimer: All opinions in this post are only my own and were not influenced in any form by employees or representatives of Altec Lansing. I have quite a thing for Altec Lansing speakers. I had a pair of extremely old speakers which were working beautifully, and I could pump them pretty loud. But then I was introduced to these. Thanks quite a lot to Altec Lansing for sending me these speakers to review and for keeps. I really enjoy ’em! These speakers are quite elegant, and feature a beautiful glass design that leaves absolutely no impression of these speakers being “sub-standard”, in fact quite the contrary. The large sub shared the same geometry as the other speakers, elegantly linking them. Another quite interesting aspect of the system is the control unit. To change the volume, simply twist the middle section of the control unit. You can determine your level of volume using the lights that appear. Also, while playing music, the lights flash in some cool patterns that you are unlikely to find anywhere else. Press the Treble and Bass buttons to control the levels of, well, treble and bass. On the side you will find a headphone jack and an AUX input, both very convenient! But in this side of the review I came across a pretty minor problem. The cables for the sound system had an incredibly hard time stretching across my three monitor array and back down under my desk. I was barely able to squeeze the cables to fit, but I eventually did accomplish that. This may not be an obstacle for all persons, but if you have a huge multiple yard monitor array to stretch across, you may need to find some kind of workaround (try putting the subwoofer on the desk!). I must say that as far as speakers go, these deliver crisp, separated, clean sound. The large subwoofer delivers bass that can literally shake the ground. The best thing about the system is that you can hear each range of sound incredibly clearly. It doesn’t seem to merge them together, almost as if every range was being played from a different speaker. This thing can get up to quite a bit of decibalage… How much, I have no idea as I don’t have one. But I’d bet it’s pretty high! The sound is really amazing even when at full blast. At full blast there is no muffling or distortion. You may go deaf (EXPRESSION! ), but other than that it’s quite a remarkable sound system. You really just can’t describe the sound that this amazing system emits. On bass rich songs, you can literally feel the bass drum hit you (almost). The ground shakes and it just about literally emits a shock wave of sound that will hit you with force (literally!). You might as well just be at the concert itself. Yet I have come across a problem. When there is no music pumping through the system, you get a fair amount of quite annoying background noise. Like a hissing kind of sound… No, this is not a particular manufacturing defect, I have heard of it on many forums online. But I actually think of it as a reminder to turn the speakers off to save energy, as that may benefit the cause of this high energy bill; after all, 200 watts is quite a bit of power sucking, plus I’m starting to get worried about the structural integrity of my floor, and I hope that I won’t be falling through anytime soon. Bass rich, but not too much! I’m not going to count that last con as very few will encounter this same problem, and as I said, this can be worked around by putting the sub on the desk, which may result in an investment in a new desk after the sub blasts right through it (almost). So the average score averages out to 8.7/10… OR FOUR [point 3] OUT OF FIVE STARS! The Altec Lansing expressionist ULTRA system sells online for $199.95, which I think is a great price for this quality. Once again, thanks a lot to Altec Lansing for sending me this speaker system for free to review and keep! For more info and purchases, visit the links below! 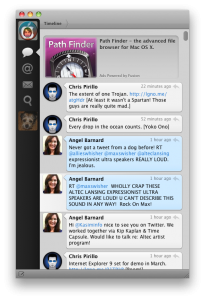 Looking for a balance between the minimalistic Twitterific and the feature rich TweetDeck? Well, you have found you match, and it’s name is Tweetie. 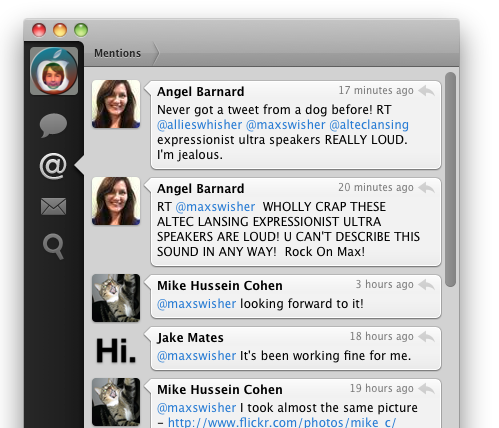 Tweetie is a simple yet feature rich free app for Mac. The free app is ad supported, but DON’T WORRY! The ads appear in-line with tweets, and use the same format, and don’t flash at all! The ads are provided by Fusion, and I’m sad to say that I’ve actually clicked on many of the ads because they looked interesting, and I actually bought an iPhone app that was being advertised. Start out by looking at the interface. As you can tell, these are simply the tweets of people I follow. In the left you can click the variety of icons, that are self explanatory [but just in case, @= replies, the envelope=DMs, the magnifying glass=search]. If you look at the replies (@ symbol), you can see there is a blue dot above it. This indicates that there is a tweet in that category that I have not read. Once I have read the tweet the dot disappears. Lets take a look at the replies tab [just click on the @ to get there]. 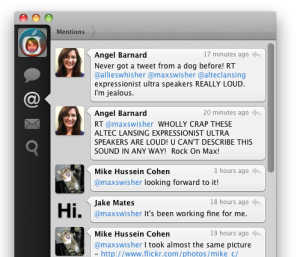 Same sleek interface, but filtered everything but replies. 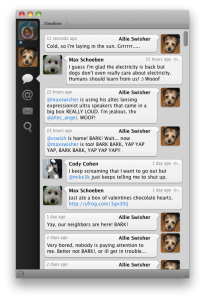 You can reply to a tweet at anytime by clicking the curvy arrow at the top right of each tweet. You can also repost (AKA retweet) a tweet by right clicking on a tweet ad clicking repost. You can set if it does ______(via @_____) OR RT @_____: _________ I prefer the RT @____:__ because it is more commonly used. 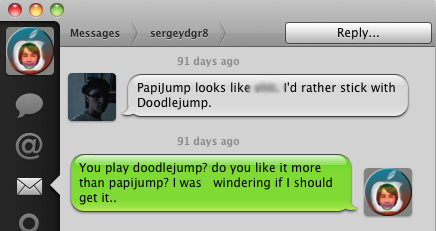 You can change that in the preferences. The DM (envelope) tab is quite interesting. 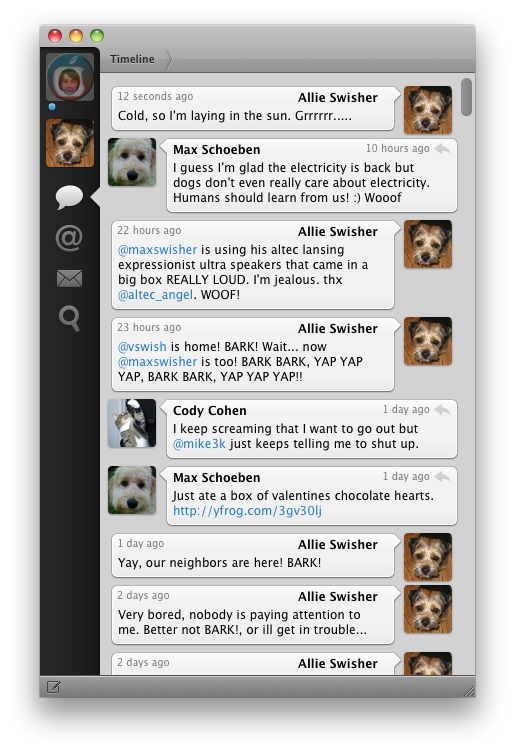 As you can tell, DMs are sorted into conversations with each tweeter (tsk-tsk) you have sent and received DMs with. Click on a user to see your conversation with them. 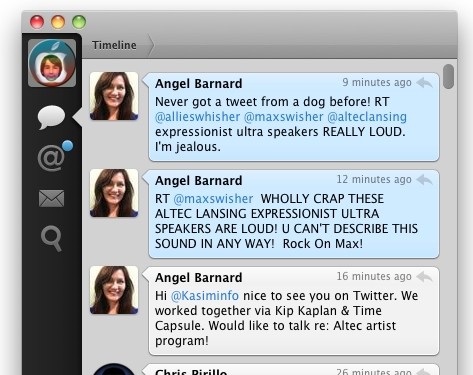 You can click the big reply button in the top right to DM someone back. 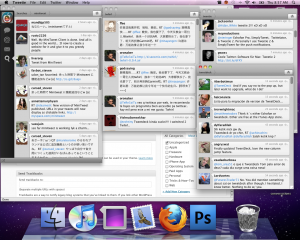 The search function is also very interesting. 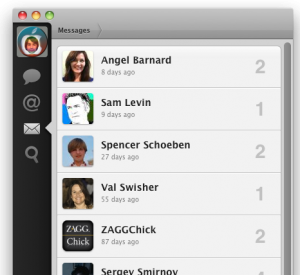 Search for Tweetie by entering tweetie on the previous screen and pressing return! To search, click on the magnifying glass. In the search box that appears in the top right, enter a term (in this case it was tweetie), and press return. 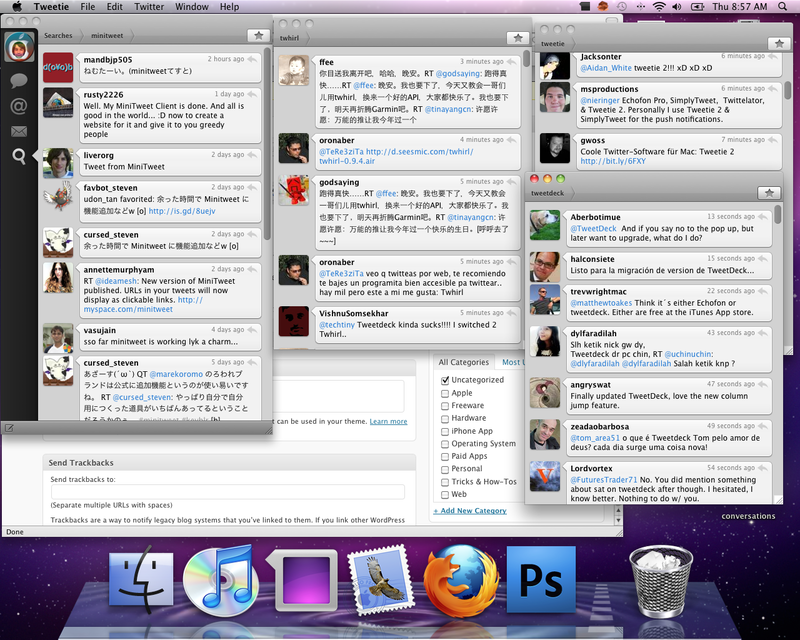 the box will disappear and tweets for your search will appear in the window. Visit any other tabs and come back to the search and the search term will disappear! Another great cool feature of search is having multiple searches in different windows. This function only available in searches. After you open it in a new window, go back and enter another term. The window will remain with the same search terms, and you can open as many windows (which means as many searches) as you want. 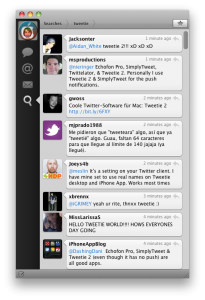 Plenty of searches for popular twitter clients! Also, did I mention you can use boolean search terms with the search (such as AND or OR)? 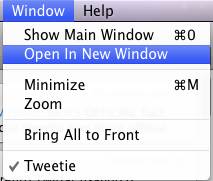 1 to create a tween, just press Command-N. a small window will open where you can type anything. Type in a URL and press Option>Command>S to automatically shorten it. Then, just press command>return and the tweet will be off. You can also get a bookmarklet for your browser so on any page, you can click on the bookmarklet and a tweet will open with the URL in it. Cool! Also, you can even assign a global hot-key so in any app, anywhere, you can press this key sequence and the new tweet window will open, and not bring all of the other tweetie windows with it. Awesome! Among all of these great things there are a couple of extra things that Tweetie does. Click on the other icon to see replies, dms, etc. for that account! Click on the icon to show the tweetie window! Well, of course I went to Macworld. 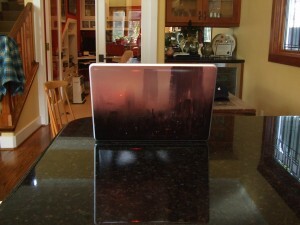 This is the first Macworld without Apple, and my first Macworld myself. #1: Would it benefit to my lifestyle? Well, MacDictate; I don’t need it, therefore it wouldn’t benefit to my lifestyle. Plus, it is how many hundreds of dollars? Scoche Earbuds. Would it benefit to my lifestyle? No, I already have a great pair of earbuds. Nope. To guage that this was in fact NOT USUAL for it to be so boring was my good friend Spencer Schoeben (netspencer.com), who I came across and assured me that Macworld isn’t usually like so. In fact, I came back with absolutely NO VIDEO at all. And I won’t be coming back tomorrow. 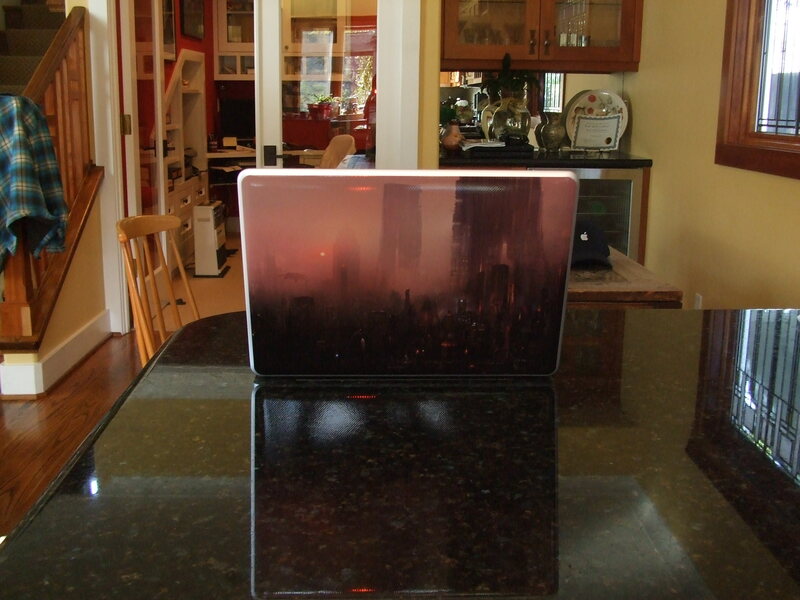 But I did pick up a Gelaskin at half price, because it was so cool and of course it was at half price, review coming soon. 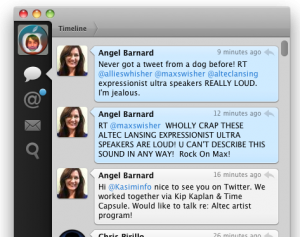 What did you think of the Macworld Expo (if you went)? I recently attended the TeensInTech conference, which was quite fun. But they also gave out so maby goodies, that I paid $35 to go and came back with more than $100 of free stuff and I got to meet Steve “The Woz” Wozniak. Worth it? Ya. One of the things they gave away was the Altec Lansing OrbitM portable speaker. And it’s worth far more than the money I paid for it. The design is overall very simple and elegant. As you can tell, it is very small and cylinder shaped. It plugs in through a standard 3.0mm jack on and iPod or mp3 player. It also comes with an adapter to plug it into the 2.5mm Jack on a cell phone. It runs on 3 AAA batteries and even comes with this convirnient carrying case, complete with caribiner. The unit comes with a slip of paper that says to turn off all base or treble enhancement settings. I must agree with them! The sound is full and deep. The tiny little thing can go really loud too! The sound is just simply pleasing, and you don’t need a small speaker preset to get great sound out if this thing. Basically, this is probably one of the best speakers of it’s size in current existence. It usually runs for $40, but they were given out fir free at the Teens In Tech Conference, held annually. This speaker totally rocks, and I got it for free!